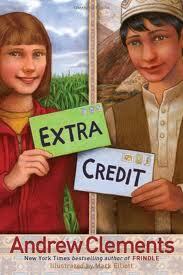 Extra Credit by Andrew Clements is a book about a girl named Abby who needs extra credit to go on to 6th grade. Her teacher gives her a few options for what to do, and Abby picks a having a pen pal. She chooses one in Afghanistan because of the beautiful mountains. Meanwhile in Afghanistan, a boy has to help his sister write the letters back to Abby. Some bad men find out about the letter-writing, and think the boy is a spy for the United States. Both children’s teachers find out, and tell them they have to quit writing. But of course, the kids decide to keep on writing to one another. This book was an okay book. I liked how unexpected things kept coming up, but I didn’t like how it left you off at the end without telling you what happened. I do like this author’s other books, like Frindle, The Report Card, and The Landry News. All of his books are about things that happen in a school setting. Extra Credit is on a 4th to 6th grade reading level.